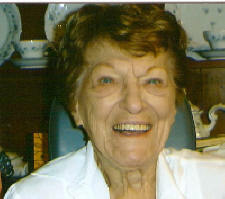 Virdell A. Evans, nee Lunte, 84, of Trenton, died Friday, July 4, 2008 at her residence. Mrs. Evans was born March 19, 1924 in Okawville to August and Alvina (Timme) Lunte; they preceded her in death. She married David Evans on May 8, 1948 in Mayfield, KY; he preceded her in death on December 26, 1993. Also preceded in death by brothers, Leroy Lunte, Virgil Lunte, and Melvin Lunte, and a sister, Alverta Haas. Surviving are her children, Georgene Evans of Baltimore, Maryland, Donn (Pat) Evans of Trenton, and Linda Evans of New Baden. 7 Grandchildren-Ryan (Angela) Evans, Grant Evans, Benjamin Meddows, Karen Carey, Gail Edwards, Janet Turner, and Liberty Bordeaux. 9 Great-Grandchildren-Riley Evans, Reed Evans, Margaret Carey, Matthew Carey, Kennedy Meddows, Elizabeth Starnes, Rogan Starnes, Katherine Starnes, and Mark Edwards. Virdell formerly worked as a seamstress at Jim’s Formal Wear in Trenton. Funeral Service will be Monday, July 7, 2008 at 7:30 PM at the Moss Funeral Home in Trenton with Rev. Thomas Rankin officiating. Visitation will be Monday, July 7, 2008 from 4:00-7:30 PM at the Moss Funeral Home in Trenton. Memorials can be made to Hospice of Southern Illinois and will be received at the funeral home.